Several rapid 2-syllable notes followed by a few higher single notes, ending with staccato trill. Description: Short-tailed, with a long, straight bill. Breeding male is green above, with a gray crown; white below; bold white eyebrow; and black eye line. 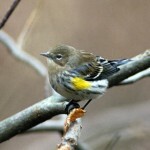 Female is tinged with yellow or olive overall; lacks pronounced gray crown; and has yellowish eye-stripe. Fall adults and juveniles are plainer olive, with white undertail coverts. 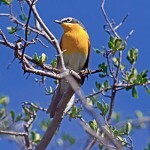 Habitat: Deciduous woodlands and forests. Usually forage in the upper portions of rather tall trees. 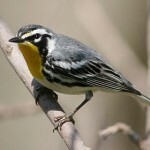 Where in Nebraska: Common spring and fall migrant in eastern Nebraska, becoming uncommon in the west. No breeding records. Field Notes: Winters around the Caribbean from Guatemala to Venezuela. 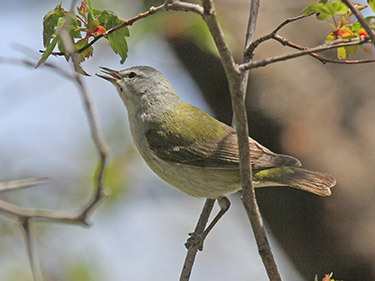 Fun Facts: Tennessee Warbler specialize in eating Spruce budworm and as a result their popultions rise and fall with the budworm populations.